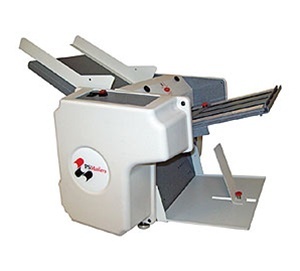 The PS Mailers PSM3000 sets up in minutes and has the versatility to fold and seal all popular fold styles (V, Z, C, EZ, and custom) with no add-on parts or additional charges. Designed for low volume mailings, up to 3,000 forms per hour, for 11" depth documents. Adjustable fold plates allow for variations in documents and accommodates custom folds. Max Paper Size 8 1/2" x 17"
Product Dimensions 12" x 14" x 17"
Folds and seals up to 3,000 forms per hour. Patented Pressure Seal Technology: Designed to be printed, folded, sealed and mailed in much less time than the conventional method. Bottom feed system increases productivity by eliminating frequent reloading of documents. Handles all popular fold styles: V, Z, C, EZ, and custom. Completely seals across document, no "pressure zones". Perfect for short run applications. Optional six-digit counter is available.